The best lightweight strollers have more features than an umbrella stroller, but are generally more compact than standard singles. Here are the best rated at different price points. Baby strollers in the lightweight category are medium to small-sized; they can look just like standard buggies and it is easy to get them mixed up. But these lightweights weigh 15 to 19 pounds and full-sized strollers start at about 20 pounds or more. These lightweight strollers are a practical alternative when you don’t want all the extra weight, but still want convenience features that umbrella strollers don’t have. 2 What is the difference between lightweight strollers and umbrella strollers? 10.1 I already own a primary (standard/jogging/all-terrain) stroller. Do I still need a lightweight stroller? 10.2 Dual Front Wheels—why do most lightweight strollers have them? 12.1 How much should I spend on a lightweight stroller? 12.2 What are the downsides of having a lightweight stroller? 12.3 How do I make sure my lightweight stroller is safe for use? What is the difference between lightweight strollers and umbrella strollers? These days when you search on Amazon or another stroller shop, the umbrella and lightweight are combined together. But for the sake of having a category that is not going to overwhelm you, I’ve separated them. There are two main differences between lightweights and umbrellas. Umbrella strollers have curved handles that look like umbrella handles, hence the name. Most umbrella strollers fold vertically – though some newer ones fold a different way – while lightweight and most other types fold flat horizontally. Another difference is that most (not all) umbrella strollers are unsuitable for newborn babies because the seat does not recline flat, nor can it accommodate a car seat if you wish to have a travel system. This type has almost no extra features such as a parent cup holder and larger storage basket. However, lightweights have almost all the same features of full-sized strollers, without the extra bulk. 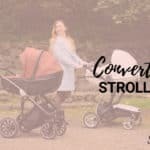 Go straight to the best lightweight strollers for 2018! Several important criteria should be considered when choosing a lightweight baby stroller. First parents should pay attention to the frame. The frame should be stable and sturdy. Most lightweights are made of aluminum. The lightweight but sturdy frame is crucial for parents who travel with their babies frequently. The best products take the abuse of traveling via public transportation, such as air travel. Many families gate-check their stroller at the airport so they can use it at their destination. Another important factor that should be considered when purchasing a quality lightweight is its safety features. A good stroller should come with a 5-point safety harness, and it should be adjustable according to the baby’s size. A safe lightweight stroller must also have rear brakes that are either hand or foot-controlled. Some have a locking mechanism, keeping the stroller from collapsing once it’s set up – you don’t want to even think about your stroller collapsing around your precious baby! The next standard feature to consider is the wheels. Wheels with good suspension are ideal for parents on the move because it provides a smooth ride for your baby as you’re zipping around. Front wheels that can swivel provide superb maneuvering in crowded areas, an important factor when you’re in the city or a crowded shopping mall. What kind of seat does it have? The seat should be padded, with strong back support. Just as you’ve chosen the best crib mattress with firm support, this feature is important with your stroller as well. Most lightweights come with seats that recline at multiple positions, even flat for newborns, which is a bonus. Most brands accept an infant car seat, turning your lightweight baby stroller into a travel system. More features to look for are an adjustable and fully retractable sun canopy to protect the baby from elements such as sun, rain and wind. You’re also going to want easy folding that is compact for storage. Extra features such as child and parents cup holders, snack tray for baby and adequately-sized storage baskets or pockets are must-haves. These features help parents to store their belongings safely and to keep the baby entertained. Best sellers usually have padded bumper bars for the baby to hold onto. Want a stroller with matching car seat, but not the bulk? You’re not alone; so do lots of other moms. The selection of strollers below accommodate car seats, but they may or may not match, and most the time won’t come together as a pair for extra savings. 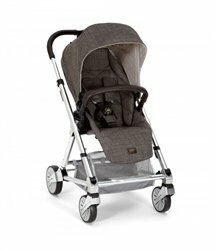 Graco has some wonderful (and MANY) lightweight travel systems, and you can also discover different brands here. Here’s an alternative to the traditional travel system. If you prefer a more modern look and want the option to add a bassinet or car seat right on the chassis AND have a reversing toddler seat, then you must look at the growing selection of lightweight reversing seat strollers. They’re generally pricier, however, the selection for all budgets is growing. Convertible strollers are far more flexible with their seating options and are highly stylish. Best of all, they are much lighter weight and far less bulky than these traditional travel system strollers! These are the best lightweight strollers for 2018. Based on user reviews, professional guides, blog reviewers and as well as personal experience, these are the top-rated products this year. Choose from a variety that fits your budget for the highest-rated on the market. Investing in a lightweight, easy to use stroller doesn’t have to involve a lot of money. 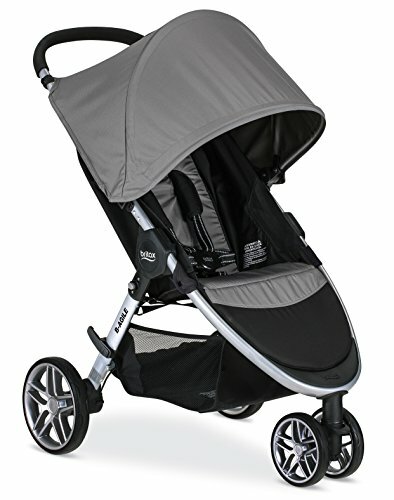 As a matter of fact, some of the highest-rated, most popular strollers are in this category! You’ll be surprised to find that some of these brands don’t even surpass $100, yet they’ve gotten excellent parent and professional ratings. A couple of these budget lightweight strollers might go over the hundred dollar mark by a few dollars, but prices fluctuate so much, so often, that if you can swing a couple dollars, then it might well be worth investigating that particular stroller. On the other hand, if you want more choice, and don’t mind an umbrella stroller, then take a look at my Top Budget Umbrella Strollers Guide. Here are the best lightweights in the budget category. For many years now, the Kolcraft Cloud Plus has been a favorite budget lightweight stroller. Compact and feather light for busy parents, this little stroller is ideal for quick trips. It is a compact product that weighs only 11.8 pounds and has an easy one-hand self-standing fold for parents whose hands are already full. For kids, the Cloud Plus has a multi-position seat recline, adjustable sun canopy with extended visor and snack tray. A 5-point quick release buckle keeps your kiddo safe and this lightweight baby stroller holds up to 50 pounds. Parents, you get a generous storage basket and parent tray with two deep cup holders. Not many lightweight strollers have so many goodies and not get too heavy. The Cloud Plus has gotten great reviews from many, many happy parents who recommend this product; it is an Amazon #1 Best Seller in the lightweight department! However, Consumer Reports has a slightly different view. Discover all the whats and whys when you read the Kolcraft Cloud Plus review. For a stroller that has a ton of great features, you can’t find a better deal than the Dream on Me Maldives. The padded seat reclines with one hand and is suitable for babies 6 months and older. Padded 5-point safety harness keeps your kiddo snug as a bug. The Maldives holds your child up to 50 pounds with its sturdy aluminum frame, and while the stroller weighs 18 pounds, it’s not the lightest in this category, but still makes the grade. The Maldives also comes with features like a child snack tray with cup holders and a parent console with cup holders, too. We parents get a nice big storage basket and the handle is angled in a way that makes it possible for most people to push the stroller without kicking the rear axle. The rear axle has two independent brakes – simple and easy to use. A sun canopy provides adequate shade for your passenger, though many parents wrote in their reviews that they wish it was bigger. The front wheels swivel or lock straight for going over bumpy terrain, and it has front-end suspension to smooth the ride. For a basic stroller, the Dream on Me Maldives has what you need and parents give it impressively high marks for the sturdiness and easy maneuverability. Simple and elegant, the Graco Verb has all the features you want in a lightweight stroller – plus more! I like the single front wheels, vs. the double front wheels, like you see in the Cloud Plus above. The overall look and design of the Verb is sleek and modern. It reminds me of the sleek lightweight stroller from BabyHome which is 3x more expensive! The Verb holds your child up to 50 pounds, yet weighs less than 20 pounds. Install your Graco Click Connect car seat for a convenient travel system. The seat is nicely padded and has multi-reclining positions for comfort and a decent sized canopy protects from the sun. Suspension and locking front swivel wheels smooths out the ride, especially over bumpier surfaces. Mom gets a generous storage basket and parent tray with cup holders. The one-hand, self-standing fold and the included carry strap are very convenient for on-the-go errands or travel. So far reviews from parents like you have given this newer member of the Graco family high praise for the easy fold and excellent maneuvering. Graco has a good selection of other highly rated lightweight strollers to browse through too – most are qualified to be on this list! The budget-plus category has a variety of strollers that verge on mid-range or is closer to the budget category. The biggest difference I’ve seen with testing these strollers is the quality of maneuvering and steering. 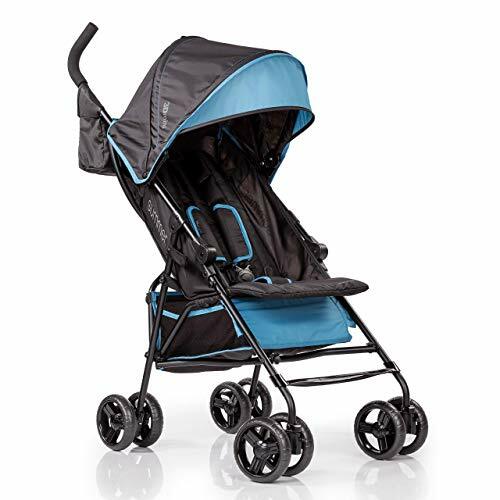 In this category, you will get strollers with better suspension systems and often times have luxuries such as an adjustable-height handle bar. Some of these products have really big canopies while others have surprisingly skimpy canopies. And with child trays or parent cup holders, some have it, some don’t. So take a look at each stroller and decide for yourself which features you must have and which you can live without because no one stroller is going to satisfy every item on our wish list. This little stroller called the XL1 Best v2 has taken the baby market by storm over the last year and it is already in its second iteration making slight improvements and upgrades. The XL1 Best v2 weighs only 11 pounds and holds your child up to 45 pounds, which will see most kids through preschool and up to kindergarten. Super light weight it may be, but it does not skimp on features! The sun canopy adequately shades your child and the storage basket beneath the seat is large enough to store your essentials. I like that this stroller includes a snack cup and child’s cup holder PLUS a removable bumper bar. For the parents, you get a cup holder and travel bag, all included with stroller purchase. The padded multi-position reclining seat is good for nap time, and it reclines at 135°, so your baby must be older than six months. This is a great option for travel, not only for the feather light weight, but for the compact, easy fold. And parents so far are giving the new Zoe XL1 BEST v2 highly positive reviews for the convenience and for their child’s comfort. For the price, we parents are impressed with the level of quality and value Zoe provides. 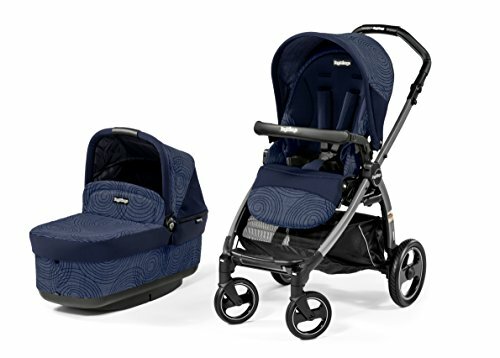 The Zoe XL1 Deluxe has all these features plus a larger 4-panel canopy, colored seat pad, and harness pads, and you’ll see that stroller featured in the View Product link as well..
For a light weight 3-wheeled option, the Graco Air3 is one to check out. While it’s not super lightweight at 21 pounds, it’s still convenient and easy to handle. Stand-out features on the Air3 include the one-second, one-handed fold with an auto frame lock. It stands alone once folded and also includes a carry handle for convenient portability. The multi-position reclining seat lays nearly flat and the leg rest adjusts up to support little legs during nap time. You’ll love the large sun canopy with an extending zip-away mesh panel and peek-a-boo mesh panel all allowing for air circulation and shade. An expanding storage basket beneath the seat carries everything you need and you get a parent tray with two deep cup holders and a covered compartment for your small necessities like keys and phone. 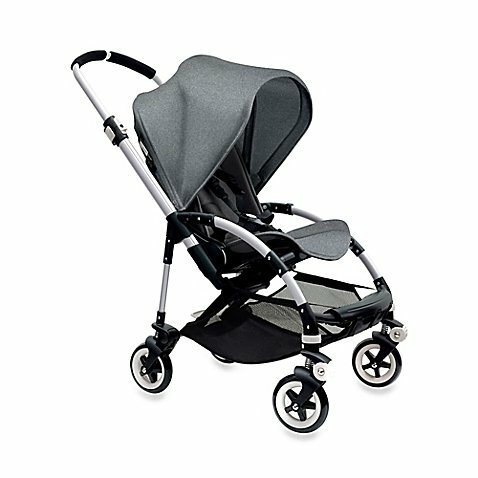 Parents love this travel system, giving it top marks for the super easy stand-alone fold, the big sun canopy, and maneuverability. These are considered mid range strollers and are some of the most popular on the market. This is the best place to start your shopping, and from here you either find the perfect stroller, or work your way up or down on the budget scale. 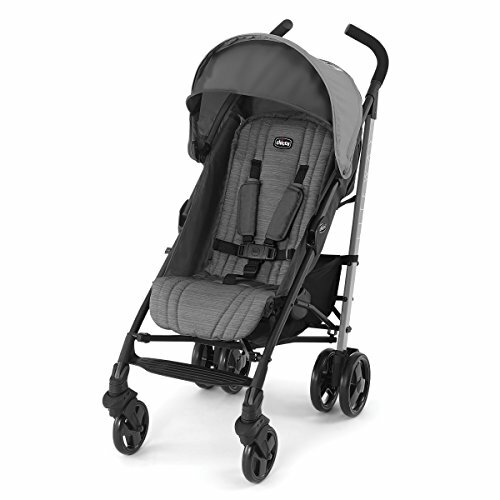 In the mid range category, lightweight strollers have excellent suspension systems. The design is updated regularly, and contemporary fabrics and colors compliment each other. Here you may or may not get a child’s snack tray, but often times, if you don’t get a tray you may get a bumper bar or little pocket for your child’s sippy cup or bottle. Folding is a breeze for most of these strollers, and most are ideal for taking with you traveling. Compact size is important, as is a weight that is light enough for you to carry the stroller easily enough. The seat is roomy and padded, designed to hold your child for years to come. 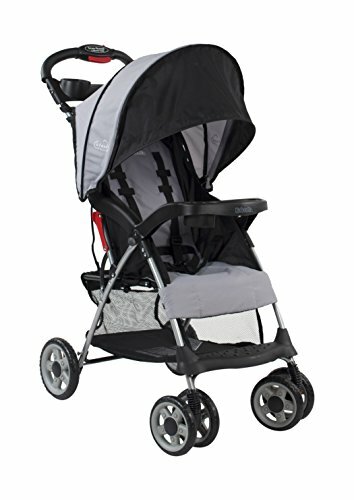 Some of these mid range lightweight strollers accommodate car seats, making a lightweight travel system, so you can use it while your baby is a newborn. Once your child is old enough to sit on their own, the stroller is small enough so your child doesn’t get feel overwhelmed in a cavernous space. Some of these models are extremely popular, others you may not have heard of. All of them have excellent reviews and ratings. Discover more about them now. OXO is a brand that carries thousands of household items and their philosophy was founded on “Universal Design” so that their products are highly useful to as many as possible. OXO Tot’s Cubby stroller certainly fits that description. A deal breaker for many parents is an easy fold and light weight. OXO’s got you covered. Weighing only 16 pounds, the Cubby is easy to transport up the stairs or into your car. It folds one-handed in seconds into a tight, compact unit that stands on its own. The frame is sturdy and has a high-tech sort of design that today’s parents find appealing. While light in weight, accommodates both Graco and Chicco car seats with an adapter you buy separately and turn your OXO Tot Cubby stroller into a convenient travel system. Otherwise, this stroller is meant for babies six months and up to 50 pounds. You will appreciate the UPF 50+ sun canopy with huge extension visor and mesh panel peek-a-boo window providing air flow and easy check-in on your passenger. The comfy seat has multiple recline positions and a padded 5-point safety harness. There’s plenty of storage underneath the seat with a flexible, expanding basket, plus storage pockets behind the seat and behind the handle bar for phone and other small essentials. 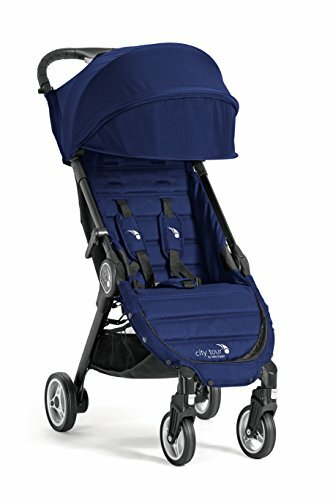 If you want a stroller with a few extra features such as an adjustable leg rest and handle bar, plusher fabric and front wheel suspension, then check out the Cubby + for $100 more. Reviews so far rate this stroller at incredibly high praise and parents love the easy fold, compact size, the lightweight and quality materials. The City Mini is one of the most popular in the Baby Jogger brand. These products integrate a patented one-hand Quick-Fold Technology and patented Universal Accessory Mounting Bracket, making it simple to add the accessories you want. These innovations make your experience with the City Mini a pleasure to use and because of these convenient features and excellent quality, the City Mini has gotten pretty good reviews across the Internet. Baby Jogger City Mini is the winner of NAPAA Gold Award as well as other distinctive honors. That’s saying something! 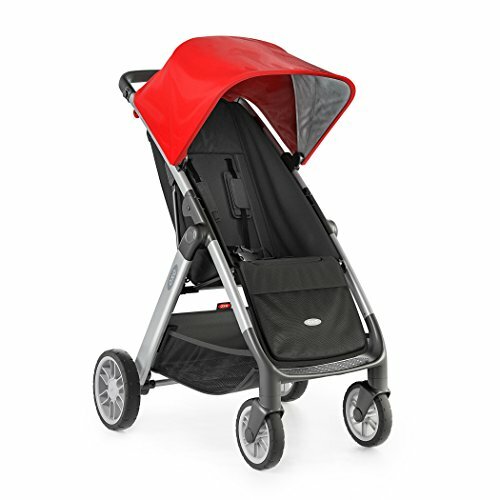 parents rave that the Mini is very easy to fold up and it has a large adjustable protective sun canopy with two peek-a-boo windows. The tall seat back and easy adjusting safety harness ensure a proper fit for the tallest and biggest passengers. It is a dream to stroll around, even when going slightly uphill. Moms love that it is very lightweight, at just under 17 pounds, making storing and traveling a breeze. This is a best lightweight stroller and is a clear favorite for savvy moms. Discover more about it in my Baby Jogger City Mini review! This is where the new Mountain Buggy Nano steps in. The easy two-step fold on this lightweight stroller compacts it down to a size accepted by most airlines for carrying on luggage. Pop it into the overhead bin and you’re good to go. One easy flick opens it again once you reach your destination. The Nano weighs only 13 pounds and has a single handlebar for one-handed maneuverability. The seat uses a strap recline for any angle your child needs for comfort. An adjustable leg rest provides support, and a three-point safety harness secures your child. A sun canopy with flip-out visor shields little eyes and front-end suspension smooths the ride. It is travel system ready and accommodates most car seat brands. 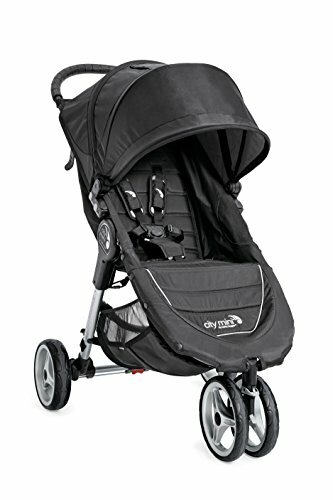 Compare this stroller with the Baby Jogger City Tour. Parents are giving this new Mountain Buggy stroller good reviews for the quality and being feature-rich for the compact size and weight. The Nano almost universally makes the travel experience for parents much more pleasant and convenient. For even more information about this stroller, check out my full review! 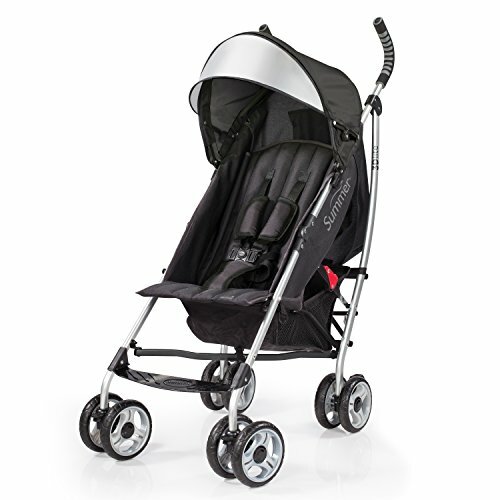 Here is a lightweight stroller that is giving the Baby Jogger City Mini a serious challenge. Weighing in at 16½ pounds, this stroller is sturdy and durable as well as attractive. What else makes the B-Agile take a place in the winner’s circle? It has a huge sun canopy, a really nice, roomy seat and a compact easy fold that automatically locks. What do parents like about the B-Agile? Moms say they love the maneuverability and that it goes over rather rough terrain, though it is not an all-terrain stroller. Parents also write in to say how much they appreciate the easy fold and the one-handed seat recline. You can also buy lots of accessories to go with it and the latest B-Agile 3 model has a variety of cheerful sun canopy colors to choose from. Reviews have been phenomenal; we’re talking seriously high marks as well as rave reviews from various mommy and baby blogs. Read my review to discover the differences between the Britax B-Agile and the Baby Jogger City Mini and why consumers adore this lightweight stroller so much! On this page, you will see the luxury lightweights that generally cost over $350, often much more. These beauties combine artful form and precision function, not to mention high fashion fabrics! You will turn heads pushing one of these gorgeous strollers down the street. Most of these luxury lightweight strollers have reversing seats. Because the seat can be removed, a separate bassinet can be placed right on top of the frame for a sophisticated pram. Or if you prefer, snap your favorite car seat for a compact travel system. Check out more options in the lightweight reversing seat category. Made from the finest fabrics and precision technology for performance, using one of these strollers makes a statement to the world: You are a person who demands the very best for your baby and for yourself. Discover which one of these beauties fit your style. Each one is different with regard to design, colors, as well as other practical qualities such as weight and functionality. A mom in New York City will have different requirements than a mom in Dallas. Either way, you will have fun comparing all of them! BabyZen Yoyo+ is a popular travel stroller in that it folds up small enough for airplane overhead bins and weighs a scant 13 pounds. But don’t let the small size fool you – this stroller is comfy for your child with a reclining seat, adjustable leg rest and a suspension system called “soft drive” that smooths out bumpy terrain. The Yoyo+ has a padded 5-point safety harness with a sturdy buckle. The canopy has a flip-out visor and offers full coverage. For parents, you will love the ample storage in the basket beneath the seat, accessible from the front or rear. You can fit a large diaper bag in there. There’s also a zippered pocket for your smaller items at the back of the canopy. The innovative, compact fold is easy to do with two steps and has its own carry strap and travel bag. A rain shield is also included with purchase. Reviews so far have been strongly positive, averaging pretty great ratings, praising the compact convenience and smooth steering. 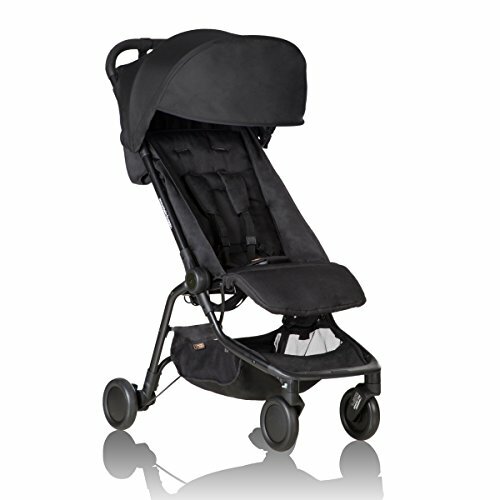 Another premium luxury product in the Mamas and Papas line, the Urbo2 is made for city strolling. Details such as a faux leather bumper bar and handle, as well as quilted lining under the canopy, exemplifies a premium, quality experience. This luxury lightweight stroller is 20 pounds and holds your child up to 50 pounds. The ultra compact fold is the perfect size for smaller spaces – you’ve got more stuff for your trunk than just your stroller. While it is a 2 handed fold, it’s quick and easy. Front-end suspension smooths the ride for your little one. I personally love the unique wheels and know from a distance that this is a Mamas and Papas stroller. You will love the roomy, reversing seat with a padded harness and lay-flat recline. Attach a bassinet or car seat right on the chassis while your baby is a newborn. Not surprisingly, the Urbo2 has gotten mostly great reviews with parents loving the design, full recline and reversing seat and the enormous sun canopy. Plus all those little extra luxury touches. Consumer Reports is more lukewarm about this stroller, though, rating it very highly overall with Very Good marks for Ease of Use and Maneuverability and a good mark for Safety. The reversible stroller seat allows the baby to face the parent or the street. The frame easily folds with the seat attached in both positions. Active brake lever, which - once activated - automatically positions itself, thereby ensuring improved safety. Simplicity is beautiful, and the Inglesina Trilogy exemplifies just that with a clean, light Italian design. A super-smooth glide is yours with the sealed ball bearings fitted in the wheels. The unique patented one-handed self-standing fold is a winner when you’re holding your baby in your other arm. Your newborn baby can ride in this stroller with a car seat (Maxi-Cosi Mico AP & Prezi) or with the optional matching carry cot that is just as chic. The recline goes flat so if you prefer, your newborn may stay in the main seat. Rich in features, the selling points for customers include a wide, deluxe reversing padded seat reclines in multiple positions whether parent facing or street facing. It has an adjustable leg rest and padded bumper bar. A padded 5-point safety harness adjusts to your passenger’s size. Sealed ball bearings in all the wheels provide an exceptionally smooth ride and one-handed steering. Parents like the generous sun canopy that folds down all the way in front of your child. It also has a peek-a-boo window. Included accessories are a rain cover and cup/bottle holder. The high ratings it receives are for the smooth, tight maneuverability and the incredibly easy, compact fold. Get even more info in my full review of the Inglesina Trilogy! Following the success of the Book and Book Plus, the Book Pop-Up stroller has many of the same features such as a premium lightweight chassis that folds inward like a book, keeping the fabric clean. Folds with seat in either direction. This stroller weighs just under 24 pounds and holds your child up to 50 pounds. The Book was named after its folding style: just like a book. It is quite simple and it stands alone once folded. The Pop Up part of the name is for the included bassinet that collapses when you are ready to fold, and pop up again for use again. I don’t know of any stroller that folds with the bassinet attached! The bassinet is also made so that baby can sleep in it for the night. The seat is reversible with a deep recline, yet the upright position is quite straight. Baby bumper bar is covered with a luxury leatherette material instead of fabric or foam. You will appreciate the full coverage sun canopy with zip out panel that extends all the way past the bumper bar. It has an air circulation vented panel instead of a peek-a-boo window. Parents enjoy an ergonomic adjustable height handle bar that you can steer with one hand. A large storage basket has a flexible rim to get to your things while the seat is reclined or the bassinet is in place. If you just want the stroller without the bassinet, and one that is lower weight, take a look at the Peg Perego Booklet that is a Consumer Reports Recommended Buy. Discover the Peg Perego Book Pop Up in this demonstration video. Without a doubt, Bugaboo is the very definition of the luxury lightweight stroller. The modern design is made for urban living, for on-the-go parents who want a product that takes them from place to place with convenience and ease. The compact size has a narrower footprint than full-sized buggies, and tight spaces are accessible, whether it’s a small storage closet or the back of a packed car trunk. An adjustable-height handle provides pushing comfort whether you’re tall or short. The mesh storage basket is bigger enough to store a large bag, plus you can hang one off the handle if you need to. Steering is buttery smooth and the brakes engage in one step. The Bee’s seat is reversible; when your baby is really young, face-to-face contact is a lovely connection. 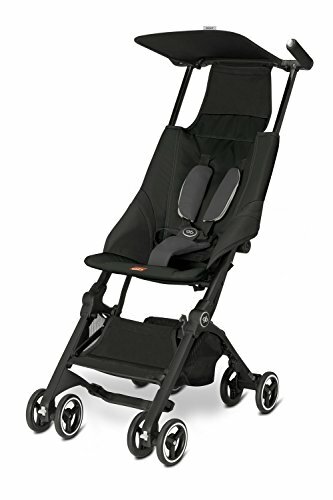 If you prefer to use your car seat (Britax, Chicco, Maxi Cosi & Cybex) Bugaboo has an adapter (sold separately) that you snap right onto the chassis. The Bee3 has the option to use a bassinet. Turn the seat around when baby is older and the stroller holds your child up to 37½ pounds, which really is not that much weight in comparison with these other strollers. The backrest and sun canopy are both height adjustable to grow with your child into toddlerhood. The seat has three reclining positions from nearly flat to straight upright. The sun canopy on the Bee3 now has a zipped extendable panel and comes down nearly to the seat, but still does not have a peek-a-boo window. Performance on the Bugaboo Bee is stellar, with independent suspension in each of the foam-filled rubber wheels. Turning and steering your Bee is effortless and one-handed. For a complete look at the Bee3, take a look at this video demonstration. I already own a primary (standard/jogging/all-terrain) stroller. Do I still need a lightweight stroller? While you may consider getting a second stroller a luxury—buying one is already expensive enough!—getting a lightweight stroller in addition to your standard-size stroller gives you a lot more freedom and convenience—which is well worth the added price you have to pay, if you ask me! For one, you can never go wrong with getting a stroller that’s compact and light enough to easily whip out of the closet or the car trunk. This feature comes super handy when you go on those spontaneous and impromptu trips (to the grocery, for example), frequently take public transportation, go on summer travels, or when gramps and granny come over to visit and offer to babysit. On the other hand, there’s a reason why you shouldn’t rely on a lightweight stroller (or an umbrella stroller) as your everyday stroller. Their compact size, while handy, may be a bit too tight a fit for older babies or toddlers. This is especially true in winter weather, when your tots are dressed in thick, thermal wear—but even then, don’t rely on lightweight strollers to provide ample protection against harsh elements either, as they’re usually made of thinner, lighter fabrics. Another feature that most lightweight strollers lack is adequate suspension. Some lightweight strollers are equipped with small plastic wheels that do little to absorb the impact of bumps when going over rough, irregular surfaces. If you’re planning to walk with your babies over longer distances, consider a sturdier stroller too, one that provides stronger seat support. However, today’s generation of lightweight strollers is versatile enough to double as your standard stroller. One example is the Zoe XL1 Best v2, which marries the storage options of a standard stroller with the compactness of a lightweight. Bottom line: If money isn’t an issue for you, then I suggest you invest in a reliable everyday stroller as well as a trusty lightweight stroller. Otherwise, I would recommend you go for an all-purpose stroller—particularly one that combines the best features of a lightweight and an everyday stroller. 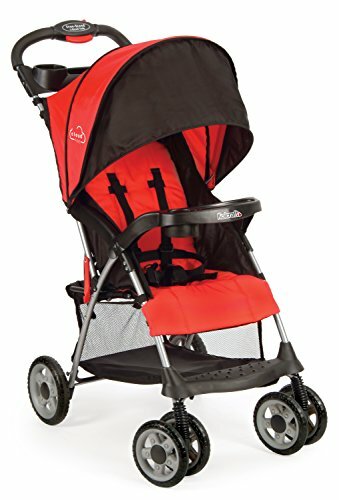 Dual Front Wheels—why do most lightweight strollers have them? 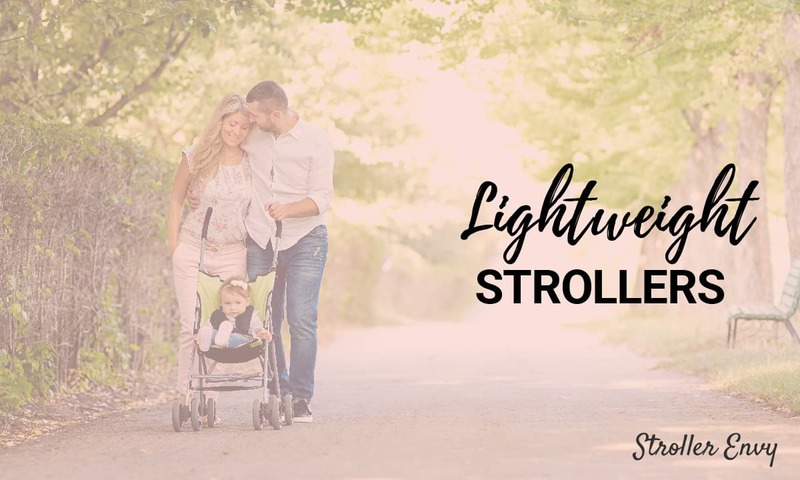 If you have a look at most lightweight strollers in the market, one common feature you’ll notice is that the front legs have two wheels each. (The Dream on Me Maldives and the Kolcraft Cloud Plus are two examples.) If you’ve ever wondered why, you’re not alone. There seems to be no definitive answer as to why some strollers have dual front wheels. Does it come with advantages? 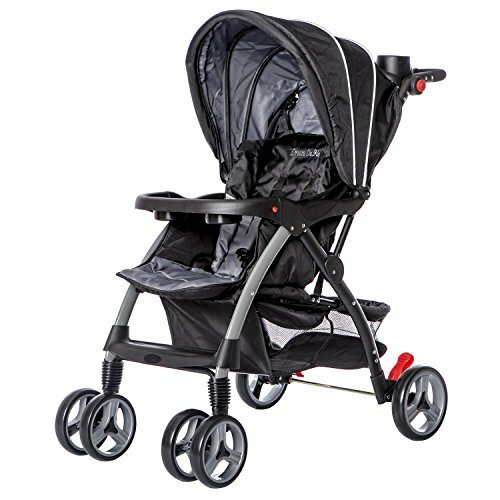 If you have a look at Consumer Reports’ test for strollers, most lightweight strollers that they advise you avoid are those that come with dual front wheels (such as the Zobo Element). The reason? They score low on maneuverability, particularly on grassy surfaces or deep gravel. In this section, we’ll round up (in no particular order) some of the most lightweight stroller manufacturers. Summer Infant has been in the infant and juvenile business for over three decades. Its headquarters is in Woonsocket, Rhode Island. Their lineup has over 1,100 products spread across the monitoring, safety, nursery, baby gear, and feeding products categories. Summer Infant offers a line of three dimensional (3D) strollers, which includes 3Dpac, 3Dlite, 3Dtote, 3Dmini, and its newest, the 3Dflip. This brand also sells the 3Dtwo dual stroller. Summer Infant, Inc., also owns the SwaddleMe and Born Free brand names. Kolcraft is a third-generation, family-owned company founded in 1946, with headquarters in Chicago, Illinois. It initially specialized in pads for cribs, playards, and high chairs, and eventually grew its line to launch several other baby products, including strollers, car seats, walkers, and potty seats. Kolcraft currently offers a range of double and lightweight strollers. It has three lightweight stroller offerings: the Cloud Plus Stroller, the Cloud Sport Lightweight Stroller, and the Cloud Umbrella Stroller. It also has two double stroller models: the Cloud Plus Double Stroller and the Cloud Double Umbrella Stroller. Founded in 1988 in Piscataway, New Jersey, Dream On Me is a member of the DOM Family (along with Mia Moda, Evolur, and Rest Assured brands of baby products). While it is known more for its line of baby furniture (such as bassinets, cribs, and beds), Dream on Me also offers a line of single and double umbrella and lightweight strollers. In its double stroller lineup are the Volgo Twin Umbrella Stroller, Villa Tandem Stroller, and the Twin Stroller. Dream on Me offers three lightweight stroller models: the Venus Ultra, Maldives, and Compacto. Meanwhile, under the single umbrella stroller category, Dream on Me has the Jasper, Cloud, and Galaxy models. Graco, a subsidiary of Newell Brands, is a baby products company founded in Philadelphia, Pennsylvania, by Russell Gray and Robert Cone in 1942. This brand offers a host of baby products including infant car seats (its most popular being the SnugRide), travel systems, strollers, high chairs, playards (it invented the Pack N’ Play Portable Playard in 1987). They also offer a complete lineup of strollers, from full-size strollers to jogging strollers, lightweight and double strollers. A relative newcomer in the stroller segment, ZOE is a family-owned stroller company started in November 2015 by owner Robert MacKelfresh in Charlotte, North Carolina. 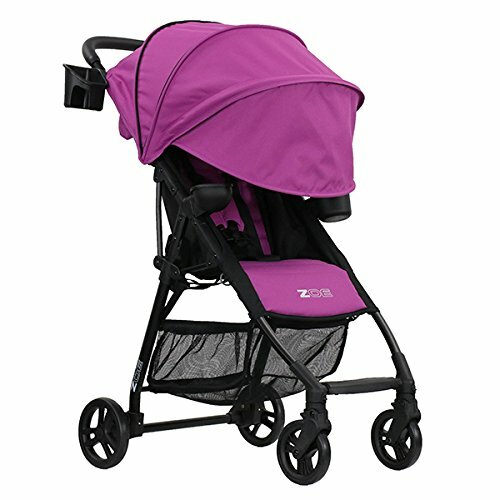 ZOE offers single, double, triple, and quad strollers. Under the single stroller category, ZOE offers two lightweight stroller models, the XL1 Best v2 and XLC Best v2. You may be more familiar with OXO as a kitchen utensils brand (in fact, you may even have an item or two of theirs in your kitchen shelf), but this company is diverse enough to even have several offerings in the stroller segment. Founded in 1990 with headquarters in New York, father-and-son team Sam and John Farber initially envisioned the company as a manufacturer of comfortable cooking tools. In 2015, OXO Tot introduced its initial stroller offerings, the Cubby and Cubby Plus, and later on the Air umbrella stroller. Founded by a mountain-loving dad in New Zealand in 1992, Mountain Buggy specializes in all-terrain strollers that boast durability, maneuverability, and safety. Aside from the all-terrain Duet, it also has several other stroller models: the Nano (and Nano Duo), Terrain, MB Mini, Swift, Cosmopolitan, +One, and Urban Jungle. Britax is a British company that makes childcare products such as car seats, strollers, and high chairs. While the company is better known for its car seats, Britax also designs and sells strollers, including full-size strollers, compact-fold strollers, and modular strollers. Two of its more popular models are the B-Agile and the B-Ready. BabyZen is a French baby products company founded in 2010 in Aix-en-Provence, France. It offers two collapsible cabin-compatible baby strollers, the Yoyo (released in 2012, and which has since been replaced with the Yoyo+). Mamas & Papas is a UK-based retailer and manufacturer of bassinets, strollers, baby products, furniture and maternity wear. It was founded in 1981 by Italians David and Luisa Scacchetti, whose initial aim was to bring Italian design to the UK baby buggy market. Trivia: All Mamas & Papas strollers come with lay-flat recline, which makes it a good choice for your toddlers to sleep in. Peg Perego was born in 1949 when Italian Giuseppe Pérego made his son a baby carriage using rubberized fabric (at a time when carriages and strollers were made with expensive sheet metal and wicker). His creation impressed his neighbors so much, they asked Pérego to make them their own carriages. Since then, the Italian company has expanded its offerings to include strollers, car seats, high chairs, as well as children’s ride-on toys. Peg Perego’s stroller line includes the Team, Booklet, Book Cross, Book Pop-Up, and Pliko Mini. It also sells dual strollers—namely, the Duette Piroet, Book for Two, and Pliko Mini Twin—as well as the Triplette Piroet. Check out our write-up on the best Peg Perego strollers here. 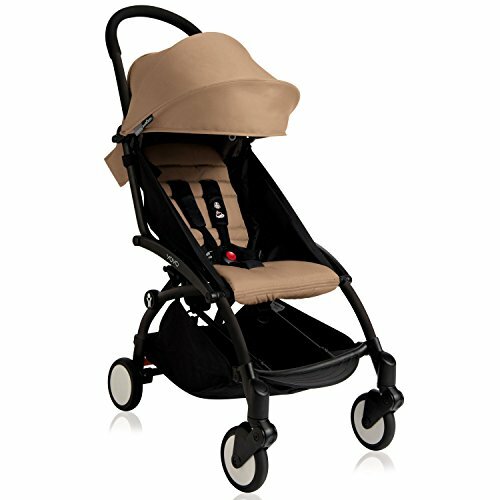 Another Italian brand that manufactures premium strollers and baby accessories, Inglesina was founded in 1963 in Altavilla Vicentina. 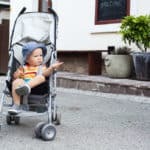 Its stroller products include the Trilogy City Stroller, the Zippy Light, Net Stroller, and the Swift (which we reviewed here). Bugaboo is a Netherlands-based company that manufactures mobility products such as strollers and luggage systems. Bugaboo’s story began in 1994 when co-founder Max Barenburg designed a stroller for his graduation project in leisure (for which he graduated with honors). Two years later, in 1996, Bugaboo was founded as a company by Barenburg and his then brother-in-law, Eduard Zanen. In 1999, they marketed their first stroller, the Bugaboo Classic. Aside from the Classic, Bugaboo also offers several other stroller ranges: the Fox (and the limited edition Fox Stellar), Cameleon 3 Plus, Donkey 2 Mono and Duo, Donkey 2 Twin, Runner, and the Bee 5. Goodbaby International was founded in 1989 in Hong Kong, China. It ranked number one in stroller sales in Asia in 1993. Shortly after that, it sold its first stroller in the USA in 1996. In 2009, it was ranked the world’s largest supplier of strollers, supplying 1 out of 3 strollers sold in China, North America, and Europe. Goodbaby International owns the Cybex, Evenflo, and gb brand of strollers and baby products. The Pockit, a gb product, is marketed as the world’s smallest stroller, and in 2014 held the title “most compact stroller” from the Guinness World Records. Baby Jogger created the first jogging stroller in 1984. Although more popularly known for its line of jogging strollers, Baby Jogger also offers several stroller variants: from double strollers, including lightweight strollers, most popular of which is the City Mini GT. How much should I spend on a lightweight stroller? It’s largely up to you, and how much you’re willing to pay for one. For starters, lightweight strollers can cost anywhere from $25 (these are the bare-bones type) to $300 (for higher-end types that come with some nifty added features). I suggest you go for the more affordable ones if you are (1) only going to use your lightweight stroller occasionally and/or (2) own a primary, everyday stroller. 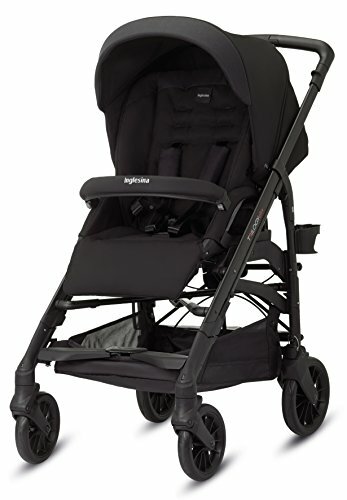 However, I would recommend you go for a premium lightweight stroller if you’re planning to make it your everyday stroller. What are the downsides of having a lightweight stroller? Many lightweight strollers aren’t compatible for use as a travel system because they can’t accommodate a car seat. Lightweight strollers don’t offer a lot of storage space, so don’t expect it to be able to carry large diaper bags. If you’re going on longer trips, a lightweight isn’t the best choice, as the small seat and wheels might make your little one uncomfortable after some time. How do I make sure my lightweight stroller is safe for use? From time to time, stroller companies issue recalls due to reported incidents with the improper use of strollers. Like I always, say, safety should always be your primary consideration above all other features. First things first, all strollers sold in the US are mandated to comply with federal safety standard, 16 CFR Parts 1112 and 1227. As an additional safety net, check if the stroller you’re looking to buy is JPMA certified (that’s the Juvenile Product Manufacturers Association). This assures you that the stroller has been tested for safety—brakes, stability, and locking mechanisms, among others. You can check the list of JPMA-certified stroller brands here. Whew, that was long! I hope I was able to cover everything you need to know before deciding on a lightweight stroller. As always, I recommend that you take our reviews and suggestions with a grain of salt. After doing your research online and narrowing your options, make sure to go to a baby store to test-drive your stroller—to get an actual feel for how comfortably it pushes (or not! ), as well as to double-check on the features you want in your stroller.